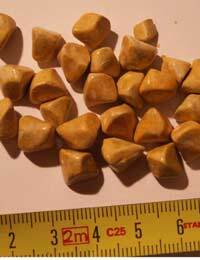 It is not unusual to have gallstones; around 15 in every 100 people in the UK has stones within their gallbladder. Not everyone knows about them, however, as they only cause symptoms in four percent of people with them. Some people are diagnosed with asymptomatic gallstones when they have an X-ray, CT scan or ultrasound scan to investigate some other, unrelated medical problem in the abdomen. The stones are made from hard, calcified material, so they show up very obviously. If gallstones do not cause ill health, it is not usually necessary to treat them but once they start to cause symptoms, they will need treatment. Unlike kidney stones, gallstones cannot be broken up by lithotripsy so that they can pass harmlessly out of the body; treatment usually involves abdominal surgery. Gallstones are actually physical stones. They are mostly made of cholesterol, which then becomes calcified. They form in the gallbladder, which is a storage organ for the bile that is produced in the liver. Bile is stored in the gallbladder and then released to flow down the bile duct and into the small intestine where it mixes with food. It facilitates the digestive process because it acts as an emulsifier. It breaks fatty foods down into very small fat globules that are then more accessible to the digestive enzymes that break down fats into fatty acids. If gallstones remain inside the gallbladder they do no harm and cause no problems. If one of the stones is carried out of the gallbladder with the bile, it may be too large to pass easily through the bile duct and it gets stuck. This blocks the bile duct, causing bile to back up in the gallbladder, and the duct itself because sore and inflamed. This causes a mixture of symptoms that include intense upper abdominal pain, feeling very sick and vomiting. Because the bile cannot exit the gallbladder, this also causes jaundice because of a build up of bilirubin, a yellow pigment that normally is secreted into bile. This pigment usually leaves the body in urine, which is why urine is yellow, and through the intestine, which is why faeces are brown. The symptoms can pass if the stone gets through the duct and into the intestine, but if it remains stuck, the symptoms will continue and treatment becomes necessary. Gallstone surgery today is done mainly by a keyhole surgery (laparoscopic surgery). This means that the skin of the abdomen is not cut open to gain access to the gallbladder and bile duct. Instead a small number of punched incisions are made to allow access to an endoscopic camera and tiny instruments that are inserted through these abdominal ports and that work inside the body. Gallstone surgery is quite a common operation because so many people have gallstones and because surgery is the only treatment for a stone that has lodged in the bile duct. It is therefore a fairly routine surgery, but it still needs to be done by a very experienced surgeon because of the risk of complications. Gallstone surgery is done under general anaesthetic and the surgeon needs to locate the gallbladder and remove it, and then reattach the bile duct so that bile can flow directly from the liver to the intestine. This is the delicate part of the operation because if this is not done correctly and bile is left leaking into the abdomen, this results in very serious illness. If this happens, the situation needs to be rectified straightaway, and this may mean a second operation, or the surgeon may need to cut into the abdomen to complete the operation by open rather than keyhole surgery. If the operation goes well, and everything has been done by keyhole surgery, the recovery is quite short. You will be up and about within hours and allowed to go home after a night in hospital in most cases. You will feel quite sore for a few days but as the tissues heal, you will start to feel better quickly and the gnawing pain of the gallstone will not be there anymore. The gallbladder does fulfil a useful function but if you need it to be removed because of gallstone problems, it is possible to live a healthy life without it. Without a gallbladder it is much less likely that gallstones will reform, and so successful gallstone surgery is a permanent cure.